The first act undertaken by a CNMI Officer is to swear under oath his or her dedication to serve and protect our community. Each day our officers put their lives on the line. This section honors those officers whose dedication led them to perform great acts of heroism. In these pages are the CNMI Officers who have died and been permanently disabled in the line of duty. Each year we honor their bravery with a Memorial Service. The event traditionally is on May 15 during "National Police Week." President John F. Kennedy in 1963 signed the Congressional resolution that each year makes May 15 "Peace Officers Memorial Day" and the calendar week of each year during which May 15 occurs as "Police Week." 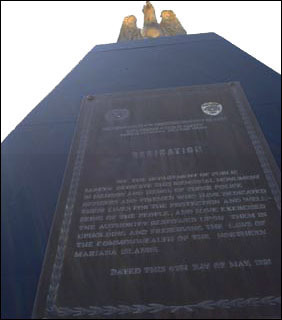 We the Department of Public Safety dedicate this memorial monument in memory and honor of those police officers and firefighters who have dedicated their lives for the protection and well-being of the people, and have exercised the authority bestowed upon them in upholding and preserving the laws of the Commonwealth of the Northern Mariana Islands.